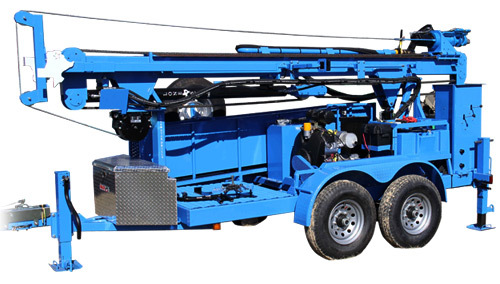 The LS400T+ Water Well Drill is the largest in the Lone Star line, boasting a 400-foot drilling depth. The drill’s hydraulic system features pull-back force of up to 15,000-pounds and push-down force up to 9,000-pounds for getting through dense rock formations. A three-way ball valve enables the operator to quickly bypass mudflow when adding pipe. It easily adapts to down-the-hole hammer drilling and offers an optional foam injection/lubricator. The LS400T+ well drill ships fully assembled in a 20-foot container.